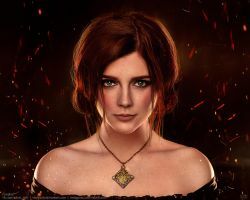 This is amazing image of Triss! I love it! Amazing and flawless work, love it. I was sent here because this version was credited to you and put on reddit. Great work! Congratulations on your well deserved DD! This is amazing! I Love Triss! Now, all we need is like a video of you creating these. The colors and values look great. this is just perfect you art the best art designer for triss out there. cant you make yennefer and ciri versions of these please cus this is just perfect. love your work. I made Ciri already. I'll paint Yennefer eventually, I promise. Amazing! Please make a version of Yen! Pretty cool. I even managed to stretch the sides and make it ultra-wide. 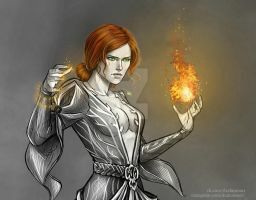 I do adore me some Triss Merigold. I'm deeply in love with her!